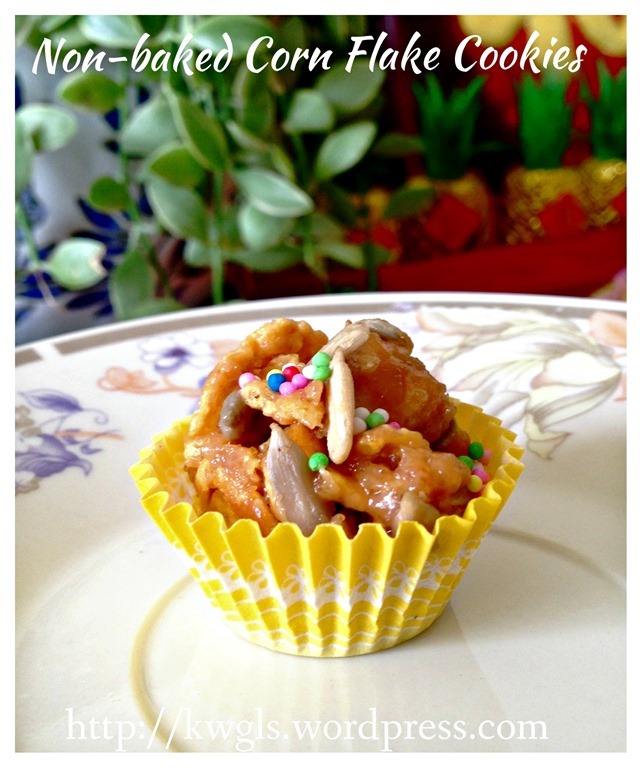 All these while, i am blogging traditional cookies and never really blog a trendy cookie.. 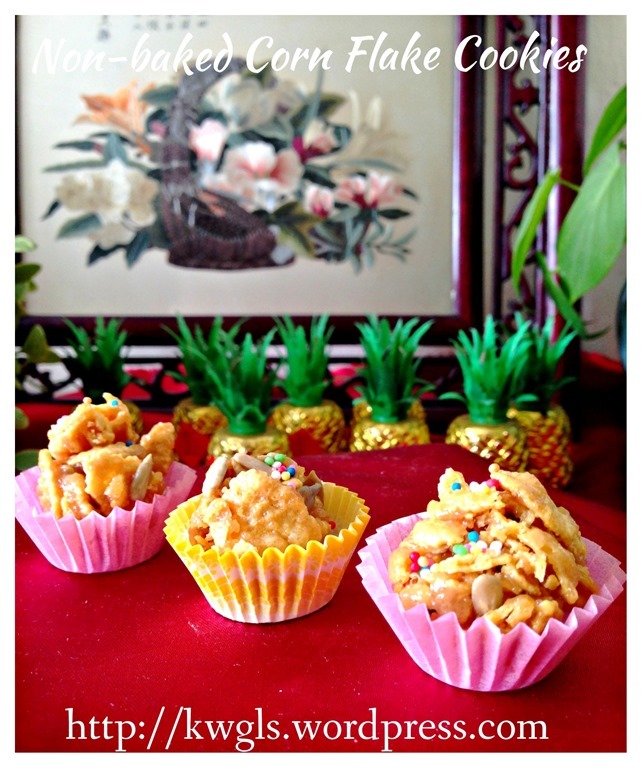 In order to diversify my cookies recipe, I have decided to blog this rather trendy cookies commonly served during Chinese New Year.. 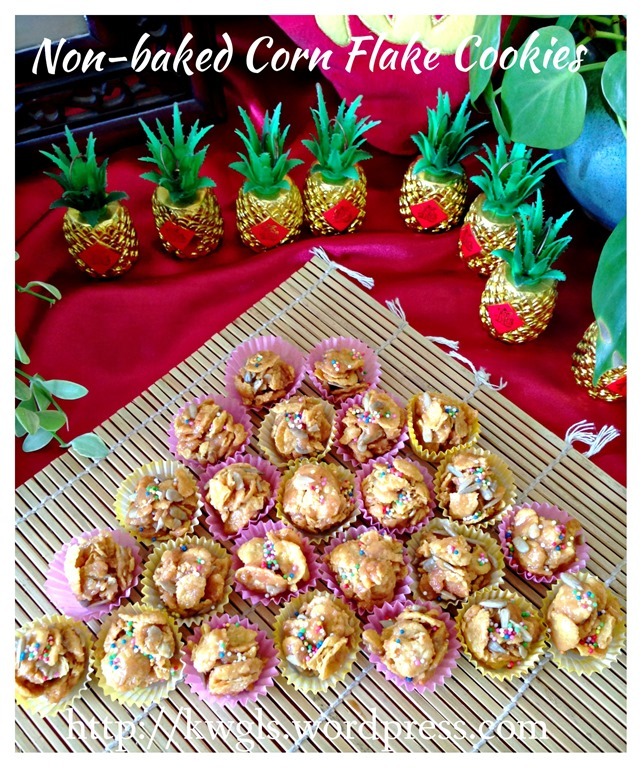 Most kids will like this cookie as it is prepared using corn flakes. 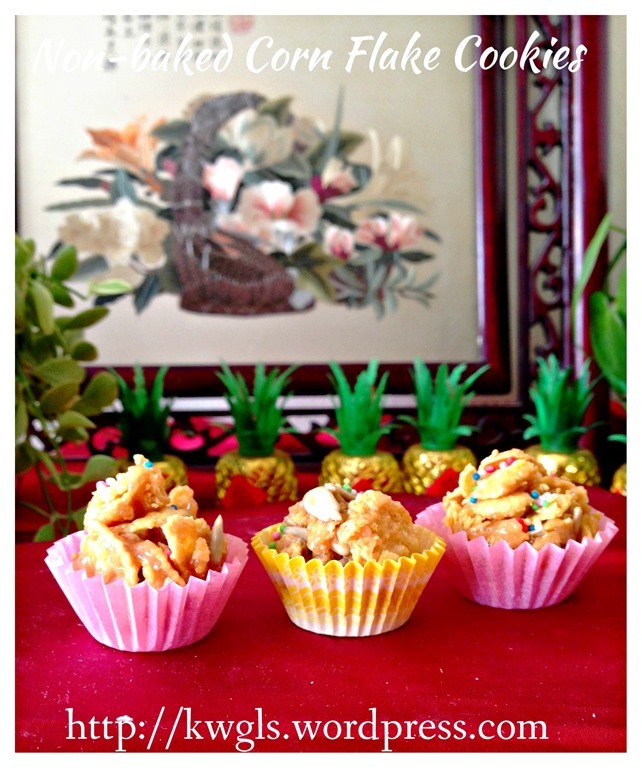 As contrast to other melt in the mouth cookies, is a crispy cookies full of cereal flavour. 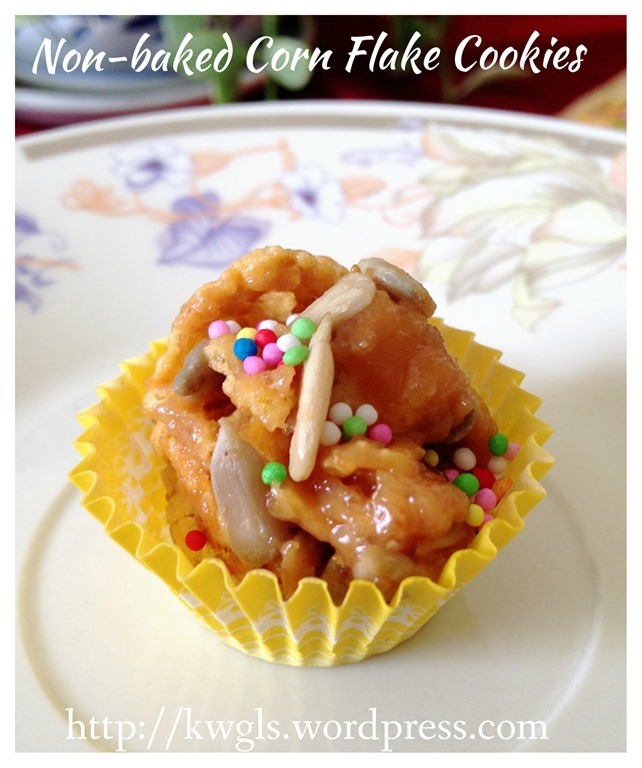 I am not new to this cookies as my nieces like to prepare this during Chinese New Year. 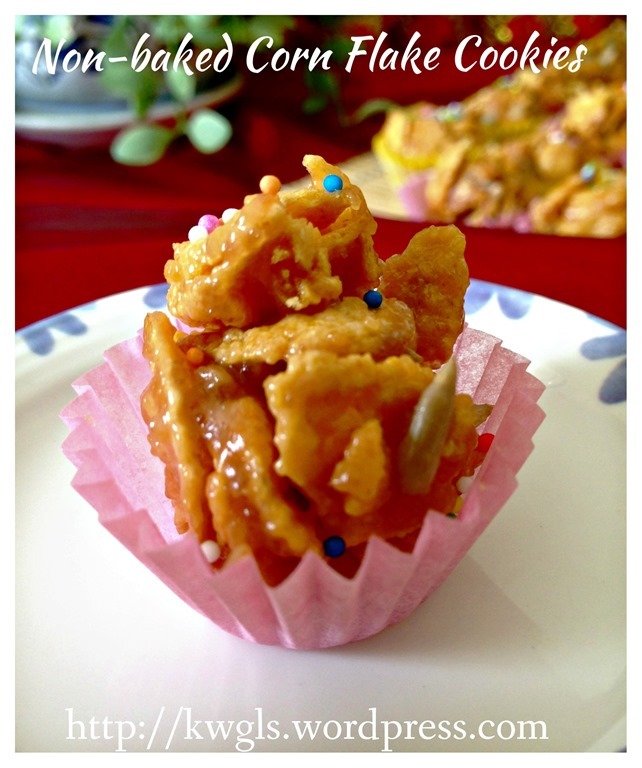 Most of the recipes in the net need to bake this simple cookies for about 10 minutes and I have purposely chosen one recipe that is no-bake version. It was prepared using peanut butter instead of normal butter.. It is a real simple easy to remember recipe. Variations are many including the nuts and the type of breakfast cereals to be used. 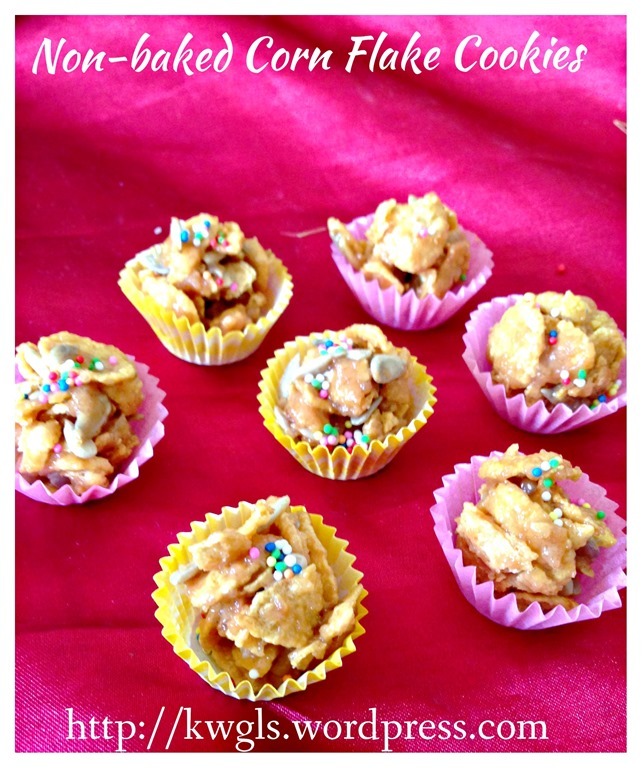 I have added some sunflower seeds to the cookies and I loved the crunchiness of both the nuts and the corn flakes. 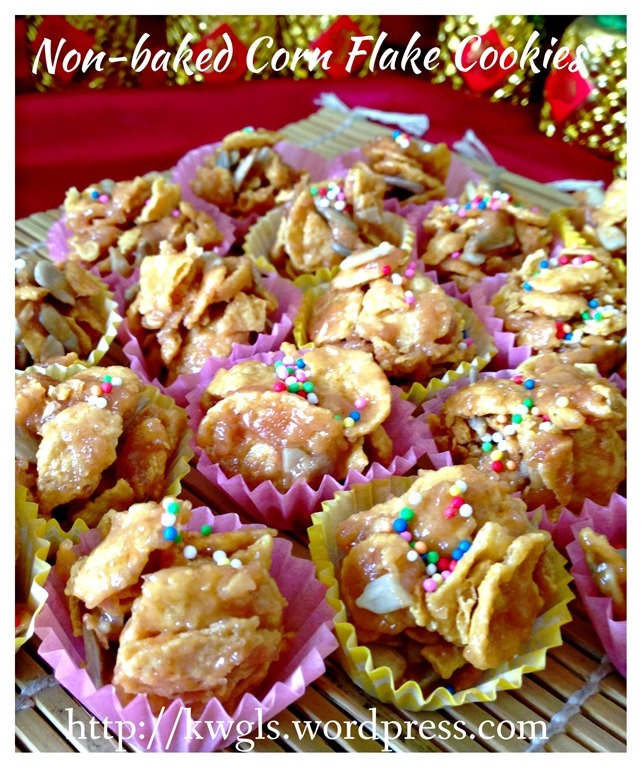 For those who do not have oven at home, this is one cookie that you can try.. Trust me, not only kids love the cookies, even adults like my wife love it very much .. lol. The family have finished the whole bottle of cookies within one day. It is easy to prepare and rather addictive. 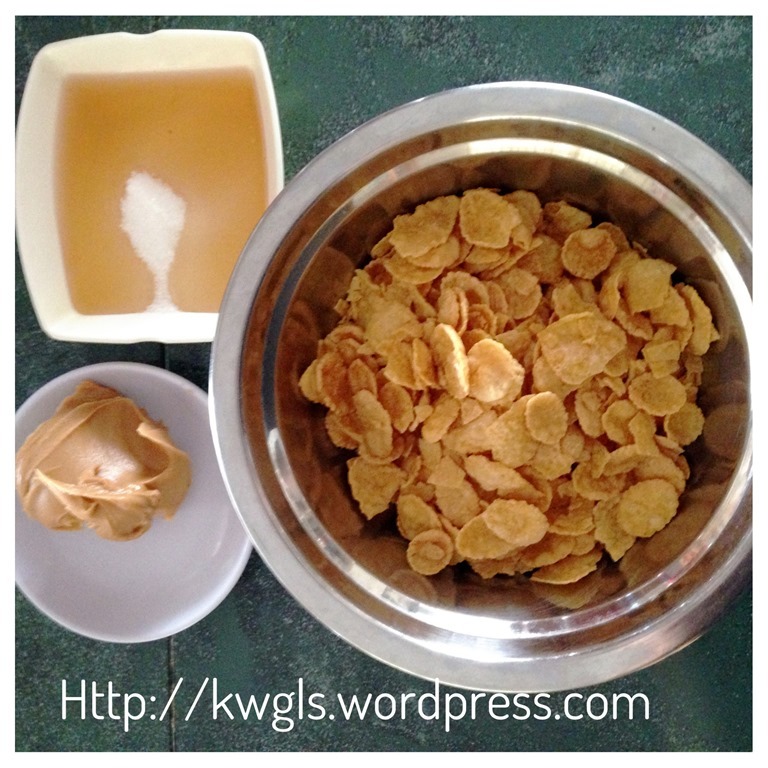 If you are concern about the sweetness, you can either use more corn flakes or reduce the castor sugar by 10%. Remember that you can always add in some nuts to the recipes, be it walnut, sunflower seeds, pine seeds, almond or others.. This recipe was included in Page 24 and Page 25 of the following E-book. 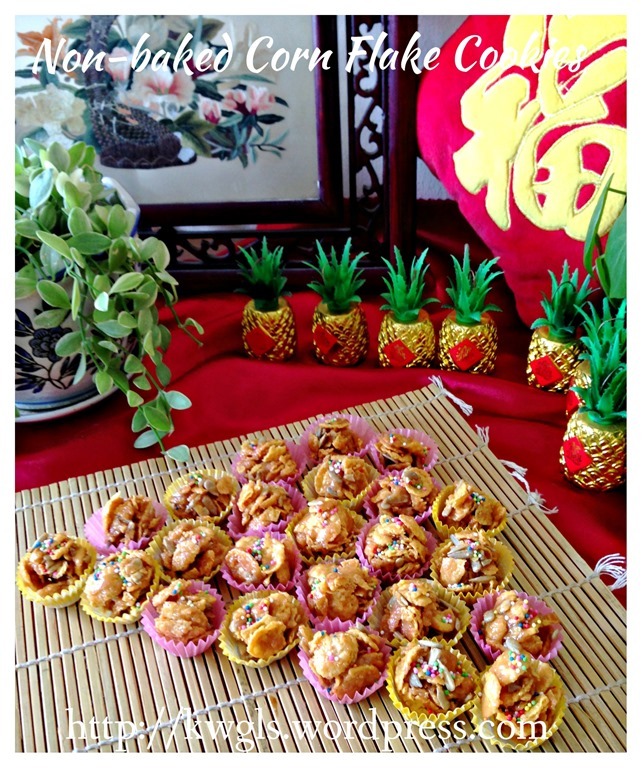 This entry was posted in Cakes and cookies, Chinese New Year 2014, Christmas 2013, Food Preparation Series and tagged 8, cornflake cookies, GUAI SHU SHU, Guaishushu, kenneth goh, postaday, 免烤玉米脆片曲奇. Bookmark the permalink. Brilliant idea. I think I would love this more than the honey that people usually use to hold the cornflakes together. Thanks for sharing. You are most welcome. If you do not like honey, you can use corn syrup or all using white sugar. 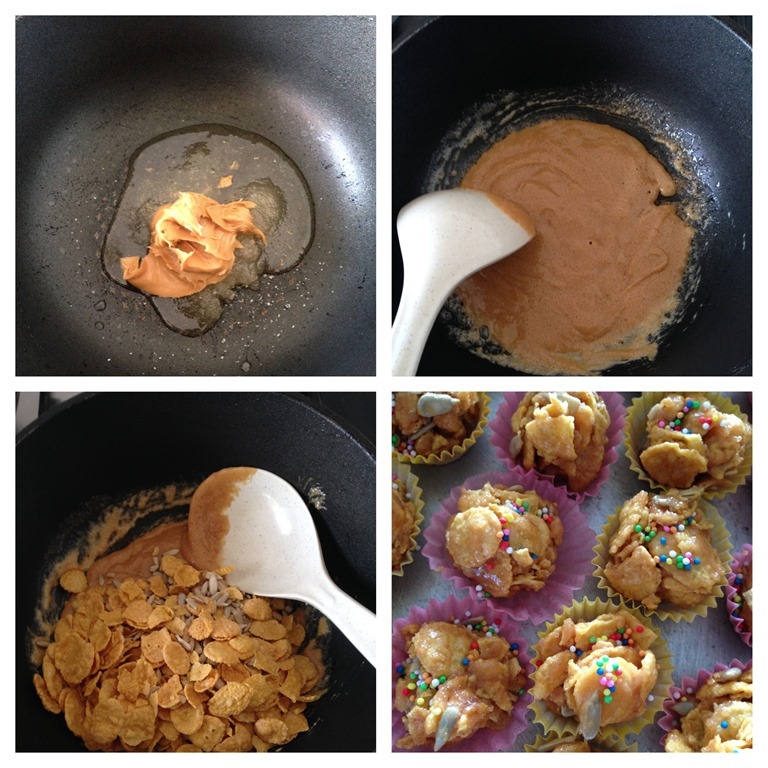 Sugar when melted will become syrup that can bind the corn flakes together. Can use melted chocolate too..
Hi Kenneth, if use melted chocolate is it means just replace peanut butter with the chocolate? The rest of the ingredient and method remain unchanged? 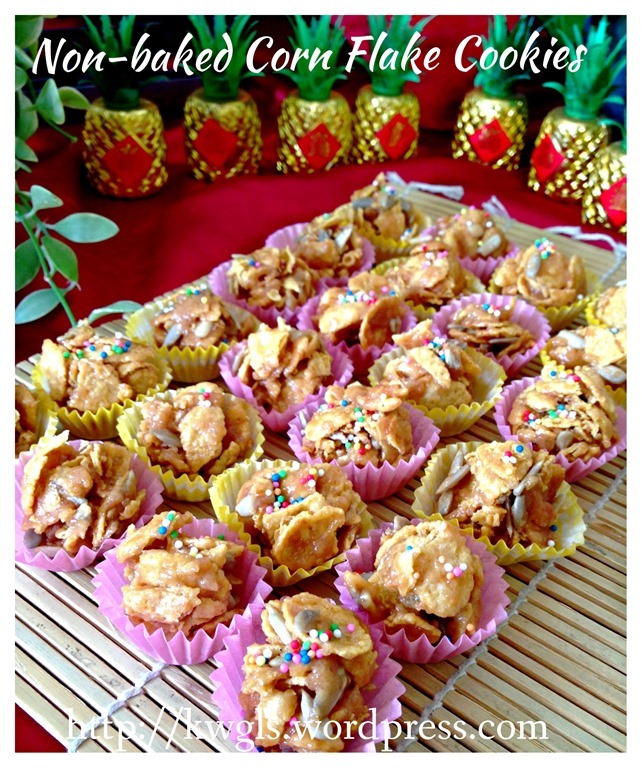 weeee.. no bake is cool especially when we run out of cookies but need more. i love the smell and crunch of cornflakes. i will definitely add in more cornflakes for that extra.crunch and ur addition of pumpkin seeds makes it even all the better. Do create your own version to share with your pools of readers. Haha. with out castor sugar also can right? increase honey a bit. Binding may not be that good without syrup. Hi, I just tried the recipe. After it’s done, the cornflakes is not very crispy (almost a bit soggy) and it doesn’t bind very well. Most likely is the boiling is not long enough meaning a bit more moisture left in the syrup causing it to be soften.